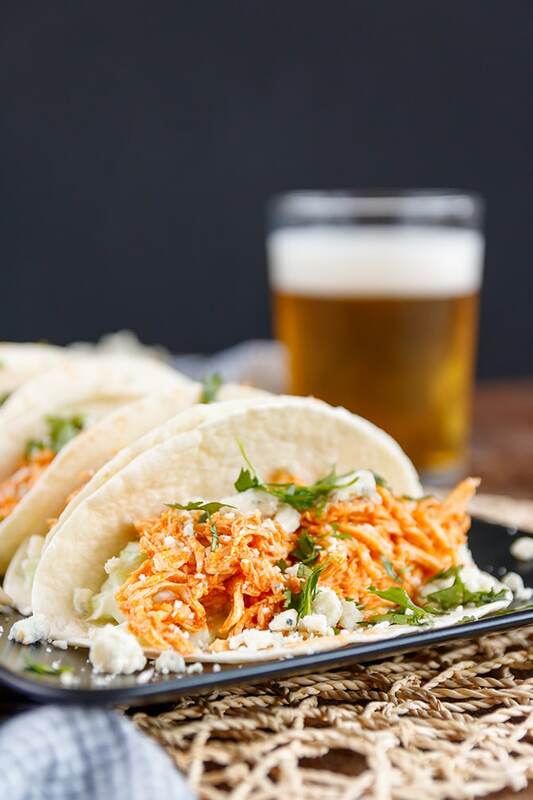 Super simple chicken tacos made with hot sauce for a buffalo style flavor and topped with sliced celery and blue cheese crumbles. It started snowing again this morning and I’m not too happy about it. It’s been sunny and gorgeous outside – albeit not warm – and without snow on the ground for a few weeks. So when I saw the dusting of snow this morning out the window, my hope of spring temps coming soon were ruined. However, after a few hours the snow turned to rain and then it got sunny outside again. What is up with this weather? It’s March, mother nature… get your ish together. I do have to be grateful, tho, that we are not in the path of that crazy nor’easter that is plummeting the Eastern part of the US and that we aren’t getting more than just a dusting of snow. I’ll take a dusting of snow here and there that melts in a few hours or the next day over inches and possibly feet right now. Oh how I cannot wait to move to southern, warmer weather permanently. Anyway, I made some buffalo chicken tacos the other night for dinner on one of the aforementioned sunny days. The hubby and oldest daughter thoroughly enjoy the buffalo flavor so I knew that these tacos would be a huge hit. And the middle baby loves tacos… so it’s a win-win-win all the way around. I have to say that these buffalo chicken tacos might just be my husbands and kids favorite of all the tacos that I have made for them. I actually tripled this recipe and made a huge batch of the buffalo chicken so that the hubby would have some good leftovers in the fridge when he got home from work in the middle of the night. These tacos are ridiculously easy to make and you can really top them with just about anything you want. I topped them with a crispy celery and blue cheese mixture because the hubby loves blue cheese. Plus, it makes it kind of like a buffalo chicken wing, dipped in blue cheese dressing, just in taco form. The buffalo chicken is really the star of the show and I can guarantee that you family will devour these with just as much gusto as my family did. Heat large skillet over medium-high heat and add olive oil and chicken. Cook chicken, turning occasionally until done; about 8-10 minutes. Remove chicken from pan and shred with two forks. While chicken is cooking, toss sliced celery with blue cheese dressing and set aside. Mix shredded chicken in medium bowl with hot sauce and melted butter until fully combined and all chicken is coated. Assemble tacos by layering corn or flour tortillas with chicken mixture, celery, then extra blue cheese crumbles.